Two weeks ago we showed you the domains which managed to gain the most Visibility during 2015 on Google.co.uk. As promised, today we will look at those who were not so fortunate between January 5, 2015 and January 4, 2016 on Google.co.uk. For this list, we once again looked at all domains which had at least 5 points of Visibility at the start of 2015. Today, only 100 domains in the UK have a Visibility of at least 62,25 points, while most domains have a Visibility of less than one point. So when a domain loses more than 100 points, like Patient.co.uk did – which we will look at shortly – we can agree that something big must have gone wrong. Looking back at last year, it is notable that Google, which was the cause for most Visibility losses in 2014 due to their many Updates (like Panda 4.0, Payday Loan 2.0, Page Layout #3), was mostly quiet. 2015 was the year where website owners managed to be mostly at fault, all by themselves. We see big mistakes being made during website redesigns and domain name changes. Hm.com, for example, managed to reduce the amount of Top-10 keywords from 829, before their redesign, to 181 keywords. But H&M is not alone: ESPN, Windowsphone.com, Pioneer.eu, Footlocker, Euroncap.com, Sony.com, Ryanair.com, Ibis.com and even the University of Liverpool (liv.ac.uk) are part of this illustrious club. Next, we have numerous domains in a slowly decaying state, such as my Myspace.com, Ehow.co.uk, Lyricsmania.com, Metacafe.com, Answers.com, About.com, Askmen.com, Last.fm and Twitter.com, where the user interest in the product or page is inexorably fading and the sites seem unable to put a stop to this trend. Let’s jump in with those domains that lost the most of their visibility, as a percentage of what they started 2015 with. When we look at the rocky landscape of Thefind.com it becomes clear that the domain managed to rush headlong into numerous Google Updates, over the years. Such an erratic Visibility is a sign that the page did not show the necessary quality signals where Google’s algorithms are concerned, nor did it manage to live up to the users’ expectations. The abrupt end for Thefind.com in 2015 came by the hand of Facebook, who bought the company in a bid to incorporate the search into Facebook’s advertising engine. Tes.co.uk decided to not only change their domain name from Tes.co.uk to Tes.com but to also freshen up their design noticeably (old design thanks to the Wayback Machine). Before the changes, Tes.co.uk had 34.800 keywords in the Top-100 on Google.co.uk – with 1.870 keywords in the Top-10 search results – and today Tes.com has 13.850 keywords in the Top-100, with 733 in the Top-10 – a loss of about 60% in the Top-10 alone. Patient.co.uk started 2015 with 141 points of Visibility on Google.co.uk and decided to change domain names to Patient.info in early June. The move itself was noticed by Google rather quickly but sadly, many of the Top-10 results that Patient.co.uk had, did not get passed over to Patient.info. While Patient.co.uk had close to 42.000 Top-100 keywords, with about 15.000 of them in the Top-10 – a whopping 35% of keywords – during the week before the move, Patient.info only manages to get about 28.000 Top-100 rankings. Out of those, they have about 5.500 keywords in the Top-10, which is nearly 20% – still not bad, but by far less than what they had before. So what happened? Did they forget their redirects? No, most pages seem to be redirected 1:1 to the corresponding page on the new domain or to a close relative. Some types of pages could potentially impact the future happiness, health, or wealth of users. We call such pages “Your Money or Your Life” pages, or YMYL. Here, we could conclude that Patient.co.uk came too close to the sun. They were the top-dog, with no other website having their authority and there was no conceivable reason why they should have changed the domain name. Instead they should have kept increasing the quality of their content even more. Businessweek was bought by Bloomberg back in 2009 but kept its own domain until last year, when it became part of bloomberg.com on http://www.bloomberg.com/businessweek. When we compare the Visibility for Businessweek.com with the /businessweek directory on Bloomberg.com, we find that the magazine did not pass it’s Visibility on to the new directory. The reasons here are, once again, soft-404 problems when redirecting each page to the new directory. When we look at the redirects from http://www.businessweek.com/technology/ through URI Valet, for example, we see the first 301 redirect to http://www.bloomberg.com/bw/technology/, next we get a 302 redirect from http://www.bloomberg.com/bw/technology/ to the start page http://www.bloomberg.com/, which constitutes the soft-404. That’s the problem. When we look at MySpace.com we do not see any major Google Updates hitting the domain but a noticeable and ongoing erosion of Visibility over the last few years. In cases like these the most likely culprit is a change in user search- and click behaviour (both of which have an influence on the rankings). In this case it is a loss of interest in this one-time social-network juggernaut, which we can also see on Google Trends, which nicely mirrors the Visibility curve. Another domain where user behaviour plays a large role is Last.fm. When a result does not pique the user’s interest anymore, Google will notice this change and adjust the SERPs (Search Engine Results Pages) accordingly. When we look at the Google Trends data for Last.fm and Spotify.com, we notice that once spotify hit the scene, Last.fm quickly started to decline. Finally I want to show you the list of those 20 domains which had the largest absolute loss to their total Visibility score in 2015. Where the previous list looks at the decrease in percentage to rank the domains, this one looks at the absolute changes. I hope you enjoyed our list and I wish you a great week! Which UK sites lost Google visibility in 2015? Hi Juan, I am Operations Director at http://patient.info , thanks for covering our domain move. The move was made for strategic reasons to address our increasingly global audience and move to a top level international domain, which will let us further evolve our services. Our focus is always on quality content that is evidence based and authored by clinicians. We are proud to be one of the most trusted sites for health and medical information, and happy that this information is now helping citizens both in the UK and further afield. It is very understandable that you chose to change domain name to better internationalise your services and I would like to add an idea which might prove helpful. It seems that the move has still not really been noticed by users as well as Google. Why do I say so? If we look at the Google Trends data for “patient uk” and “patient info” I notice that the users’ search behaviour has not changed at all. The Graph suggests that, even after the move, users are still actively looking for the old domain – where it is important to note that users use Patient UK as the brandname for patient.co.uk – instead of the new, which is hardly measurable. Additionally, Google Suggest will show “patient uk” as the second most searched for term, when we type in “patient”. It might be worth considering letting you users know that the domain has changed, maybe through the use of a .info behind your logo. When I look at your old site in the internet archive, I noticed that you informed your users on every single page that they are on patient.co.uk, right besides the “register” and “sign in” links (picture). This repetition will also have helped Google notice a connection between your brand and UK searches. Now, this is not the case anymore. Another interesting information, which shows how Google might not fully have understood the move, is Google’s “People also ask” feature. 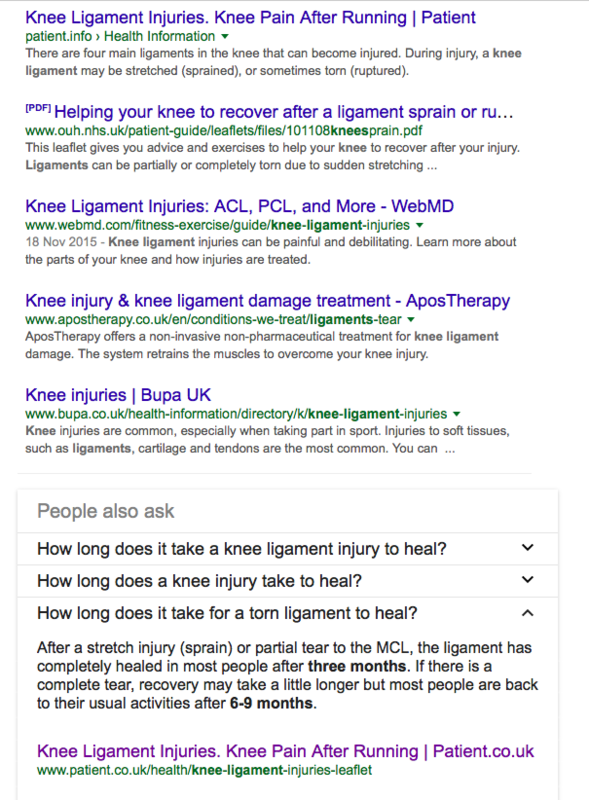 If we look at the results for the searchphrase “knee ligament injuries”, for example, I get one organic result for patient.info and then a “People also ask” box with a result from patient.co.uk (picture), even though the page itself is redirected correctly. It might be a good idea to ask John Mueller during one of his Google Office Hours why Google might still be uncertain to show the new domain in the feature box? I wish you all the best and I keep my fingers crossed. With a site as large as ours (millions of pages indexed) google themselves have said that it can take 6 months to a year to fully de-index and re-index the site. The rich snippets you mention from the “people also ask” box has in some cases updated to the new domain name and in other cases (like you have pointed out) is still yet to update.